I posted this article last September 10. Almost a month since and there is no noticeable improvement around my eye area. I religiously applied this cream around my eye area as instructed day and night. So for those who are looking into trying this one out, you really should go look for another. Unless you have a spare $16 to spend this on. 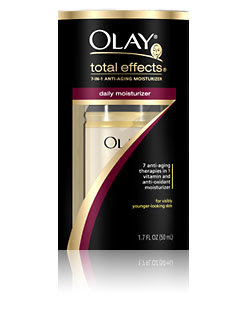 I have been using Olay Total Effects ever since it has made waves a few years back. I then thought it was just one of those beauty products that vows of greatness that will not deliver. I was wrong. At least for me, it completely replaced everything I used back then. I am such a “kikay” at heart that I tend to experiment with just about every new product that comes out in the market, I know it’s not the ideal. It’s good that my face tolerates such experimentation and is not prone to acne when I apply any cream that does not match my type of skin. But another observation from the several bottles that I have bought: The first few bottles, I felt a real significant difference on my face (less fine lines, smoother feel). But later on, I honestly feel that the makers of this product have become complacent in maintaining the quality of its formulation. It used to be that there was only one formula: the 7 anti-aging therapies formula in a bottle, as how they would have it. But after a while, as with all the other marketing strategies, they have created a need for people to get a hold of a their new products (eye care, day care, night care) which I honestly did not buy any of. It could be that they have toned down on the original benefits so that consumers will feel the need to buy their other product. I’m not really sure. But I’m trusting my instincts and even as I trust my instincts and still keeping on using the same product, I press on to welcome better stuff that may come along to match what the original first batch of Olay products gave us when it first arrived in the Philippines some years back. 1. Line Minimization: Reduces the appearance of fine wrinkles. 2. Nourishing Moisturization: For a radiant, healthy glow. 3. Tone Enhancement: Balances color & reduces appearance of age spots. 4. Gentle Exfoliation: Smoothes and evens skin texture. 5. Pore Refinement: Minimizes the appearance of pores. 6. Free Radical Defense: Helps prevent damage to skin’s surface. 7. Subtle Lifting: Hydrates for firmer skin appearance.